An honours student, Mr Bongumusa Comfort Mthethwa, from the Department of Biochemistry and Microbiology, Faculty of Science and Agriculture, made the University of Zululand (UNIZULU) proud by publishing his honours project work in an accredited journal with an impact factor of 3.6. Mthethwa was born in Mhlabuyalingana in the Oqondweni area. He grew up in a rural area, living with his mom. He went to primary school at Oqondweni school, but later moved to live with his brother and sister and studied at Isibonelo secondary school, located in KwaMashu Durban. After matric he joined the UNIZULU for a BSc degree in Biochemistry and Microbiology. Mthethwa finds Biochemistry a very interesting field. He says that UNIZULU is a pleasant environment and the lecturers are very supportive and friendly. He describes Prof Khajamohiddin Syed, his supervisor, as instrumental in teaching research aspects step by step in the field of Bioinformatics, a field that was recently introduced at UNIZULU. He feels that the Bioinformatics field poses challenges, like any other research field, but loves working in Bioinformatics, as it is a scarce-skill area in Africa and gives him an opportunity to grow. 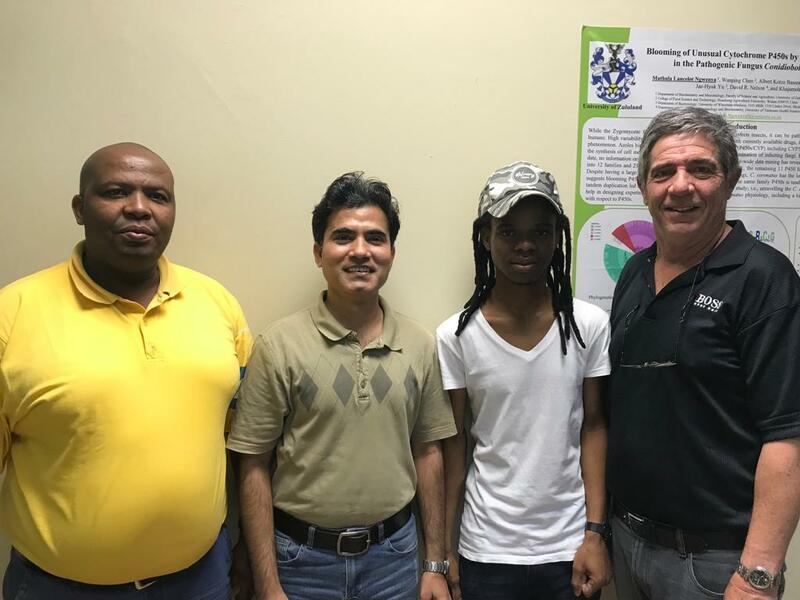 Mthethwa’s BSc honours project focused on identifying secondary metabolites, such as antibiotic-producing genes in Bacillus bacteria, with special emphasis on identifying the cytochrome P450 enzymes involved in the production of secondary metabolites. The study findings, entitled “Comparative analyses of cytochrome P450s and those associated with secondary metabolism in Bacillus species”, were accepted for publication in the International Journal of Molecular Sciences. Mthethwa praised his co-author, Mr ML Ngwenya, for helping him with technical aspects of the study and providing logistics. He also highly acknowledged the head of the department, Prof Albert Kotze Basson, for his strong encouragement and full support to the laboratory. Mthethwa is looking forward to continuing his studies and is hoping to work in a pharmaceutical company one day.